This chapter discusses strategies aimed at regional-economic structural change in the German Ruhrgebiet. The Ruhrgebiet used to be the largest industrial area in Western-Europe. After the crisis in the coal and steel industry the region pursued re-industrialisation policies in the 1960s and 1970s. These attempts were largely unsuccesful. 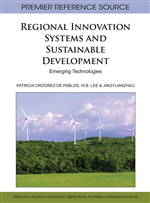 Therefore, since the 1980s the involved actors gradually adopted regional innovation strategies. Thus, they were able to break out from the region’s lock-in situation. The re-orientation of the Ruhrgebiet towards innovation based on the industries’ expertise and past (e.g. environmental technology, energy and industrial tourism) is more successful than its earlier re-industrialisation attempts. Also for other old industrial areas in Europe this kind of place-based renewal might be the future. In many of Europe's old industrial regions, the process of structural change has resulted in substantial decline and rising unemployment. Ironically, those very areas that were the forerunners of the Industrial Revolution were forced to given way to new growth poles in the European economy. In particular regions specialised in ‘smokestack’ industries such as coal, iron and steel, heavy engineering, textiles and shipbuilding have been hard-hit by industrial decline (Hassink & Shin, 2005; Birch et al., 2008). The widespread effects of this de-industrialization process can be clearly seen over the years by the steady rise of European regions that received support from the EU’s Structural Funds. Jointly, this regional mosaic of traditional industries – including such areas as the West-Midlands, Wales, Wallonia, the Ruhrgebiet, North-Pas-de-Calais, Lorraine and the Basque Country – has been termed Europe's ‘Rustbelt’ (Cooke, 1995). With a mix of strategies, European, national and local authorities have tried to rejuvenate these traditional regions since many years. In the literature, the Ruhrgebiet, Wales and North-Pas-de Calais are often highlighted as areas where local parties have pursued such restructuring policies with varying degrees of success. In the coming years the issue of how to deal with regional industrial decline will be high on the European policy agenda again. The fact is that the enlargement of the European Union with member states from Eastern-Europe has resulted in a significant expansion of Europe's Rustbelt. Especially in Poland, Hungary, Slovakia, Romania and Bulgaria many regional economies are still highly dependent upon smokestack industries (Lintz et al, 2007). Although the shakeout in inefficient heavy manufacturing has taken place, the restructuring of these traditional industrial regions is anything but completed. To note an example: the so-called ‘GOP’ in Silesia, being Poland's major economic area with industrial conurbations such as Kattowice, is still dominated by mining and steel production. These industries still employ a considerable part of the region's work force. Coal and steel have not only shaped the region's socio-economic structure, but also its landscape: because of the pollution problems in the GOP, public authorities have denoted it as an 'ecological disaster area' that needs restructuring to be able to comply to West-European standards. Obviously, regional industrial decline once more is a topical European problem asking for appropriate and timely policy responses. In this context, the long-lasting experiences of older industrial regions in Western-Europe with restructuring might provide inspiration for how to deal with the problems in the rest of the continent. The chapter at hand analyses such an inspiration source, the case of the German Ruhrgebiet. This region is perhaps Europe's most well-known example of an old industrial area in which structural change has been occurring since about fifty years now (Birch et al., 2008). The article is organised as follows. First, to place the case in context, we give a rough sketch of the Ruhrgebiet and its economy. Next, we study the re-industrialisation strategies that have been pursued in the Ruhr as well as the associated problems caused by regional lock-in. Then, the focus is on the bottom-up strategies aimed at regional innovation. After that, we assess the restructuring efforts of the Ruhrgebiet and have a look at the area's future. Finally, we trace some implications the Ruhr-case might have for the other regions that are part of Europe's Rustbelt.